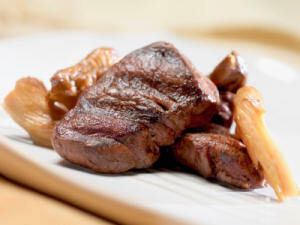 Similar to pork, venison pairs great with fruits, especially when stewed with wine. Port, apples, and cherries make for a lusciously fruity dinner. 1) Season cutlets with salt and pepper. 2) Heat oil in a large skillet over medium. Add cutlets and cook until browned on both sides, about 8 minutes total. Remove from skillet; place on serving platter. 3) Add apples and cook until lightly browned and softened, stirring occasionally, about 5 minutes. Remove from skillet; arrange over cutlets on platter. 4) Place wine, butter, and cherries in skillet; bring to a boil over high heat. Reduce to a simmer and cook until thickened, about 5 minutes, stirring to prevent burning. Pour sauce over venison platter; serve immediately. This may just become one of your favorite ways to enjoy apples.